Police shot an unarmed man, began to perform a cavity search, and then shot him a second time after they suspected he was breaking into his own vehicle. Police in Mesquite, Texas, shot a burglary suspect and employed at least three officers in their attempt to arrest him, after they claimed he was trying to break into a pickup truck—but the unarmed man owned the truck he was sitting in, and he was trying to fix its malfunctioning alarm when he was approached the officers. According to a report from CBS DFW, police were called to the area around 7 p.m. on Nov. 8 after an individual reported that someone set off a car alarm. While police claim there was “an altercation, a scuffle began and the individual ended up being shot,” they have yet to release any of the details about what specifically happened and when the officer opened fire. 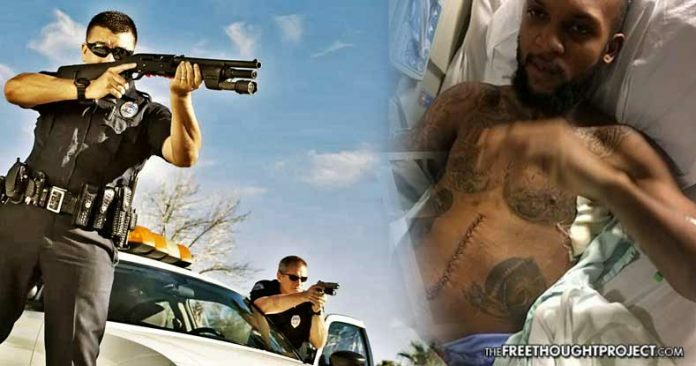 Lyndo Jones, 31, was charged with one count of evading arrest, and he spent one week in intensive care in the hospital for bullet wounds in his stomach and his back after he was shot by Derick Wiley, a 10-year veteran of the Mesquite Police Department. The only problem is that Jones owned the vehicle he was occupying, and there was yet to be body camera footage released to verify the officer’s account of the incident. Mesquite Police Lt. Brian Parrish justified the officer’s actions, telling CBS DFW that arresting Jones was the sensible thing to do, even if he does own the vehicle. “He was detained because we had received information that there was a burglary in progress and, regardless of who owns the vehicle, regardless of what the actual situation is, if an officer receives a call that there is a burglary in process and arrives at the scene and finds what he deems to be a suspect, it is just simply a prudent matter to take that person into custody and further investigate and find out if the person is up to no good, and if they are, then we move forward with an investigation,” Parrish said. Another attorney for Jones, Lee Merritt, told WFAA News that after police were quick to shoot Jones in the stomach, they then attempted to perform a cavity search, before shooting him a second time in the back. Jones’ attorneys also claimed that officers violated his constitutional rights by forcibly interviewing him about the shooting when he was in the hospital and his legal counsel was not present. Merritt noted that in its initial statement about the shooting, the Mesquite Police Department failed to mention that Jones owned the vehicle the officers claimed he was burglarizing. “That was not a mistake. That was an intentional misrepresentation to the public,” Merritt said. Derick Wiley, the officer responsible for the shooting, has been placed on administrative leave while the department claims it is investigating his actions. Although police attempted to charge Lyndo Jones with evading arrest, the Dallas County District Attorney’s office has since dropped the charge. As the Free Thought Project reported earlier this year, police were caught on video tasering a young man’s testicles and his body — until he died. Then, in June we learned that although the Dallas County District Attorney Faith Johnson found that the officers involved had committed a crime during their torture — they cannot be charged. Officers Jack Fyall, Richard Houston, Alan Gafford, Zachary Scott, William Heidelburg and Bill Hedgpeth, the ones responsible for the death of Graham Dyer, all work in the same department that shot Jones.